Perfect on the go snack for babies and toddlers. Individually twin wrapped making them brilliant for lunch boxes and picnics. Very easy for self feeding (finger food). A brilliant product, especially when they are on offer! My son loves these so much as they taste nice. He loves bananas. Easy to give as quick snack. Melts quickly. Can be a little bit messy if wet. Price is a little expensive. These waffers melt pretty much straight away once in babies mouth so minimal chance of chocking. These snacks are easy enough to throw into a changing bag and go. There are two in each pack and quite a few in the actual bag. Once in your child’s mouth they melt quite quickly so less chance of chocking. Many different flavours for your curious little tinkers. My daughter loves them. Ever since my boy began to wean I have been giving him these as a snack. They are great at young ones learning to use their hands and begging to try new textures and tastes! They are also a great MESS FREE snack to give thoes toddlers on the go! I don't know a kid who hasn't liked these. My son loved them my friends 2 kids loved them as for many other friends. 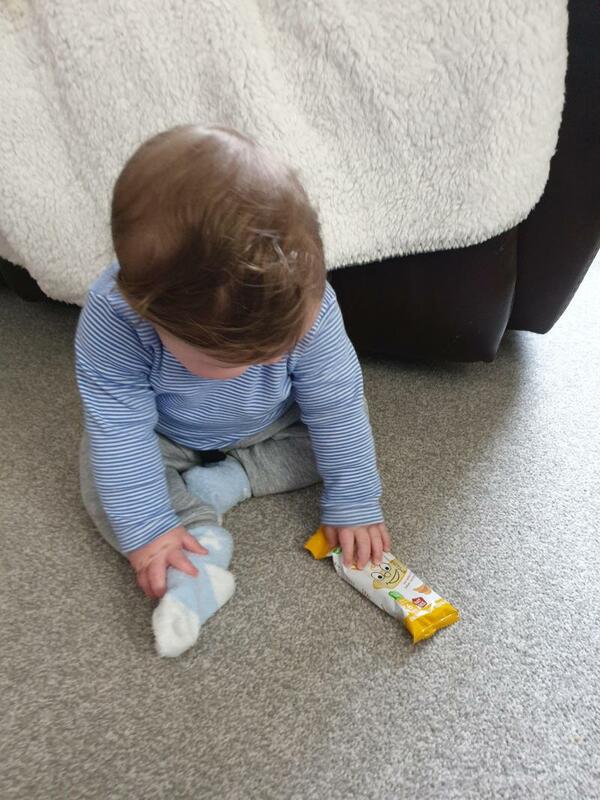 the taste is overpowering so perfect for little ones just finding out new flavours. These are super for my daughter to hold and chino on. I often give her then as a morning snack as they are handy to pop in her changing bag for when we are out. My.daughter is only 6 months old but I wanted to try her with some finger food as baby led weaning. I purchased these, at first I didn't read the packet so was pleasantly surprised that they are individually wrapped which is fab because they don't go soggy once bag opened. I used with car the first time with them being from 7 months but she was fine with them, they dissolved easily in her mouth, there her favourite now, she laughs when I get the packet out. I have tasted myself and they are quiet nice although only a hint of banana but young children don't want strong flavours anyway. 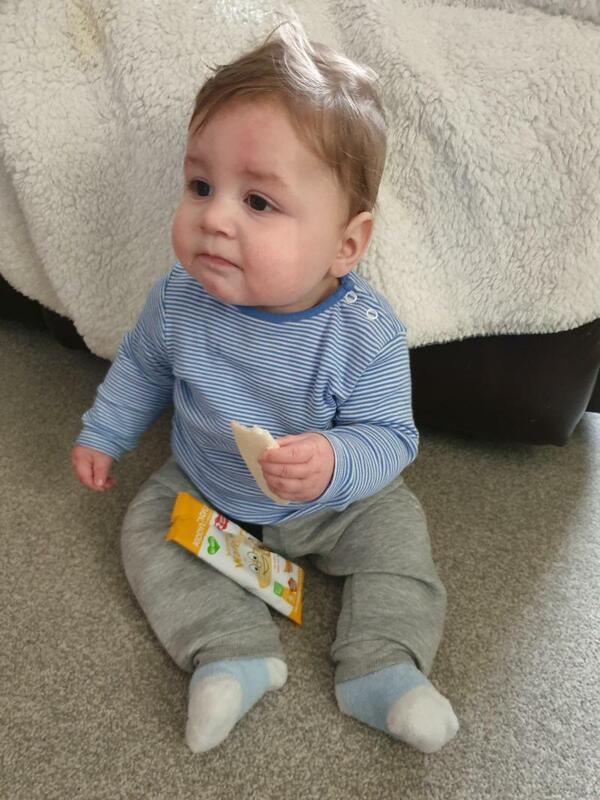 These wafers are always in my house, my baby boy simply loves them, he loves all of the flavours that they come in. 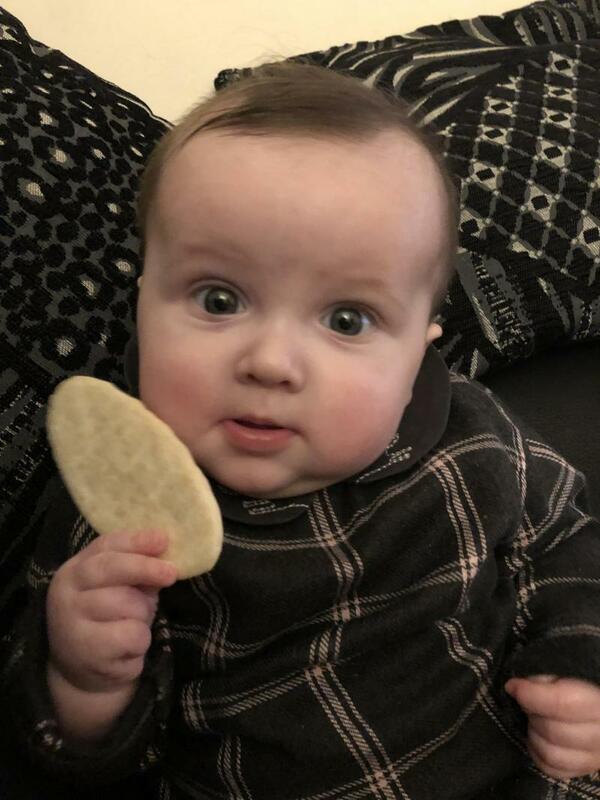 I love how its help teach my baby from 6 months how to hold food and feed himself. I would highly recommended these! My son loved them and they make no mess, they didn’t crumble or flake and they didn’t mark his hands. My daughter absolutely loves these wafers, they are easy for her to hold and don’t go messy and gooey. Perfect for little hands and for first tastes. I bought these so my baby girl could get used to holding food and feeding herself. She easily grabs it and does just that. I wanted to try her out with solid food that goes soft a bit first so she gets used to chewing. She loves them! They come in a pack of two which is a bit of a con as I only give her one a day. I would highly recommend if you’re a nervous mum who’s starting to wean. The product is great for nervous parents trying finger feeding weaning. They can become a sticky mush. These baby snacks are great for taking with you, especially in a hurry. They are a great addition to a balanced mix of snacks. They are individually packaged allowing you to slip them in your bag. I found them particularly helpful to give as a quick snack for my hungry baby as I prepared his meals. My daughter still love this. 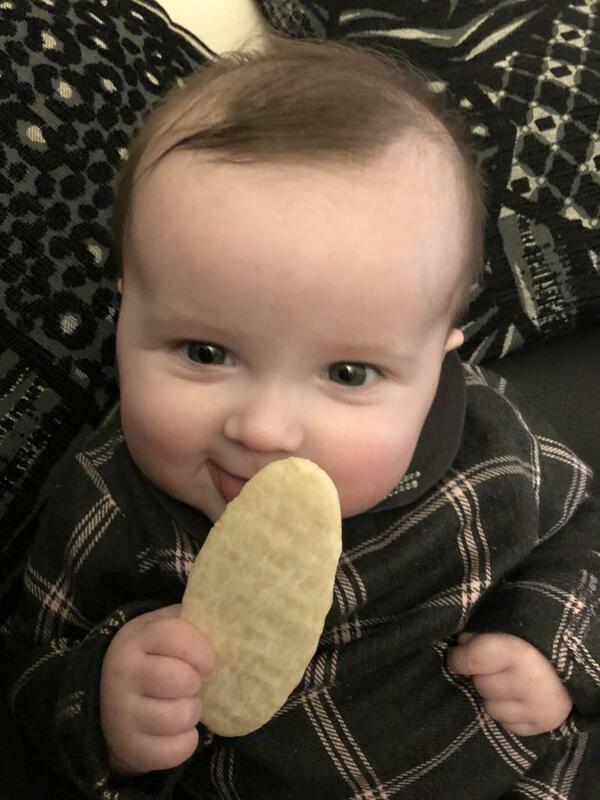 Taste like bananas and help her to develop the coordination and independence. The shape is great and I love the idea of giving her tapioca flour because this is a very healthy ingredient. Easy melt in your mouth wafers. I struggled finding snack for my youngest as she struggled with lumps and textured. I was recommended to try these by her nursery & she absolutely love them! Certainly a firm favourite in this house. 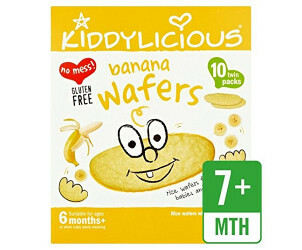 We love the wafers, infact we love all the flavours of the kiddylicious range. My son has used them from around 6 months and still loves them now at 22 months. My partner and I have even had a snack on them ourselves. They are easy for babies to hold and put to the mouth which is a huge bonus, and they seem to just disintegrate once wet. I think it's great they dissolve so quickly as I don't feel I panic about them being a choking hazzard as much as I do other finger foods. I always have a pack in our changing bag as they are just so quick and convenient. The only thing I would say is you need to clean your children up quite quickly after they have had a good muncgt, as if they aren't so great at actually eating the wafers they can seem to weld on to your babies fingers, nails and any surface they have been eating on. But babynled weaning is messy anyway, so I feel mess is basically inevitable. I highly recommend these and the other flavours, they are a great starter finger food. These are a favourite in our house, my 2 and 3 year olds both love them as well as our 7 month old. The only downside is they’re very low calories so for little ones of high calorie diets they’re not ideal. My boys seven months and seen these and though little man would like them . Well they were a great hit! The packaging is brilliant They come in boxes and then individually wrapped with two wafers in each pack so perfect for taking out when on the go for a snack , being wrapped in packs of two means they stay fresh. Can be found in various flavours. They are brilliant as dairy and gluten free and suitable for vegetarians. They are a great size for little hands , my boy finds them easy to hold and encourage self feeding . My boy eats them well with very little mess . They get sticky if wet and found bits stuck to his clothes but other than that are brilliant even my older children love them and they are eight and nine. Highly recommended. My little boy absolutely loved these! They were easy to eat as they melted in his mouth and it made him happy that he could snack when everyone else was. They are very easy to hold and devour. At first my girl would be a bit messy whilst eating, so getting the damp wafers off clothes and things was not easy, but at 8 months she's able to eat it all without any mess, meaning I can have these in my bag as an emergency snack when we're out. They come in single portion packs which is absolutely amazing, as you don't want crumbs and bits in your bag. They are a bit pricey, but they're regularly on offer at boots or other stores, so easy to stock up. We struggled to find good snacks for our daughter who was diagnosed with a CMPA at a very young age. However these where perfect, she loved eating them from and early age easy for her to hold and chew and enjoyable also. 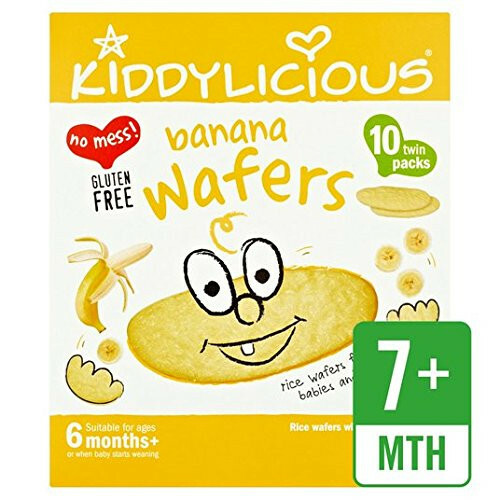 Kiddylicious Banana Wafers: These rice wafers with a hint of banana dissolve easily so they are an ideal choice for weaning. Made with real fruit and vegetables, their texture also makes them a welcome snack for teething. Those Wafers can be used to spoon and scoop up food. Great for snacks on the move.